Biosecurity – Are You Doing It? As horse owners, biosecurity is something that we do every day – whether we consciously think about it or not. It’s also something we should be doing MORE of every day. Biosecurity is anything that we do to protect a population (in this case, horses) against harmful biological substances. In the horse world, these are preventative measures we take to limit and minimize the spread of disease. In the case of biosecurity, every little bit counts! Whether you are at home (house or boarding facility), or on the road, biosecurity should be something that you think of on a regular basis. 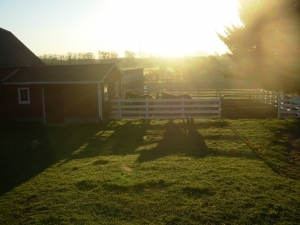 Biosecurity measures already should be part of your “barn habits” on a day to day basis. The key to successful biosecurity is developing your own personalized plan for at home and on the road so that these procedures can become habits. What follows is by no means a comprehensive list, but a few things to consider as you start to formulate your plan. The first step to good biosecurity is to optimize resistance to disease. Vaccination is your first line of defense. Understand your horses’ vaccination needs by working with your veterinarian and taking into consideration your horses’ job, age, location, and region to determine the best vaccination schedule for them. Keep in mind that just like humans, stress will reduce your horse’s ability to fight off disease and weaken their immune system. Diet is also critical, as a horse with adequate nutrition is better prepared to fend off disease than one with any nutritional deficits. The second aspect of a good biosecurity plan is to control exposure to disease. Cleanliness both at home and on the road are requisite in minimizing exposure. 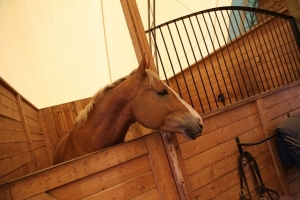 At home, a clean barn goes a long way toward a healthy horse. Don’t leave spilled grain, sweep up concrete floors, employ a good barn cat to control rodents and insects, and practice good fly and mosquito control. Rodents and insects frequently transmit equine diseases between horses, so limiting their exposure to your horses is key to good biosecurity. When on the road, a clean trailer and show stall are important. 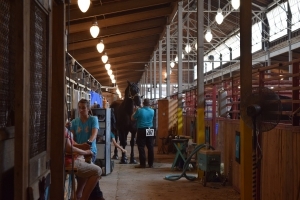 No one wants to finish a long haul and clean a show stall top to bottom, but at least taking the time to clean the front, where your horse and every other horse spends most of his time will go a long way. Sometimes the obvious things are the easiest to overlook. At a show, or when a new horse arrives at the house or boarding facility, take precaution not to let horses “communicate” or touch noses. When a new horse arrives, having an area set aside as a “quarantine unit” is good, but go a step further and make sure that your feeding and cleaning pattern is not compromising your quarantine. The new horse should be fed, cleaned and handled last, with boots and clothes being disinfected or changed after moving through the quarantine area. Additionally, think through the potential ways that you or any staff would inadvertently contaminate your barn. This includes veterinarians, farriers, grooms, riders, etc. who may be bringing in disease. Despite our best efforts, occasionally something may get through the cracks. 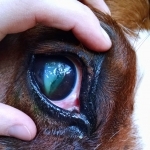 When an outbreak does occur, knowing your horses and having the ability to identify sick individuals quickly is paramount to controlling the spread. 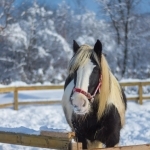 For example, what is the normal heartrate and temperature for each horse? If one is acting a bit off, and you know that he is always between 99.2 and 99.8 degrees, and he is now 100.9, you can guess that he is on his way, even if he is technically not febrile yet. 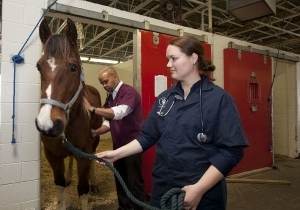 Know what you’re going to do with a sick horse once identified. There is no right answer to this question, but it is an essential part of every biosecurity plan. Consider these points, think of your own, and begin to develop an overall plan. As always, when in doubt, don’t hesitate to ask for veterinary advice!